Doughnuts – just the thought puts a smile on my face. Doughnuts were standard fare growing up in Iowa.. We didn’t eat them daily but we did eat them regularly. They were a delicious treat – enjoyed together and never on the go. Saturday mornings were filled with cartoons and doughnuts. In the 70’s we only had 4 channels to choose from and cartoons were definitely not a 24/7 option. Dad dreamed of sleeping in on Saturday mornings – but with 5 kids squabbling over the tv channel it was rarely an option. Off we would go to pick up doughnuts. His favorite was a cake doughnut with chocolate frosting and peanuts but mine was a filled doughnut – with jam or cream. We had lots of mouths to feed so we got to make lots of selections – glazed with frosting and sprinkles, chocolate cake doughnuts with chocolate, frosted with coconut, apple fritters and maple bars, I loved visiting the doughnut shop. It smelled of coffee and sugar. We never discussed whether we should be eating doughnuts. We just ate them and enjoyed them. Hell, we ate butter on our bread. Everybody ate doughnuts. You would read about them in books. Homer Price couldn’t get his Uncle Ulysses’ doughnut machine to stop making doughnuts, Laura Ingalls Wilders’ future husband, Almanzo ate doughnuts and fried apple turnovers for lunch, the Bobbsey twins ate doughnuts to “take the edge off their hunger.” Trixie Belden ate doughnuts to rouse herself from her “groggy condition”. In high school we loaded up our schedules early in the day so we could leave early afternoons and swing by the Hinky Dinky to pick up doughnuts filled with cherry jelly and topped with white frosting. Perfect with a cup of coffee and a dose of Guiding Light. Why don’t we eat more doughnuts? We happily eat bagels, muffins and croissants for breakfast relegating doughnuts to the list of treats too delicious to be enjoyed. I’m not suggesting we eat dozens of doughnuts, not even a doughnut a day – but doughnuts are a delicious part of life and Ana’s doughnuts at Via Umbria are transformative. 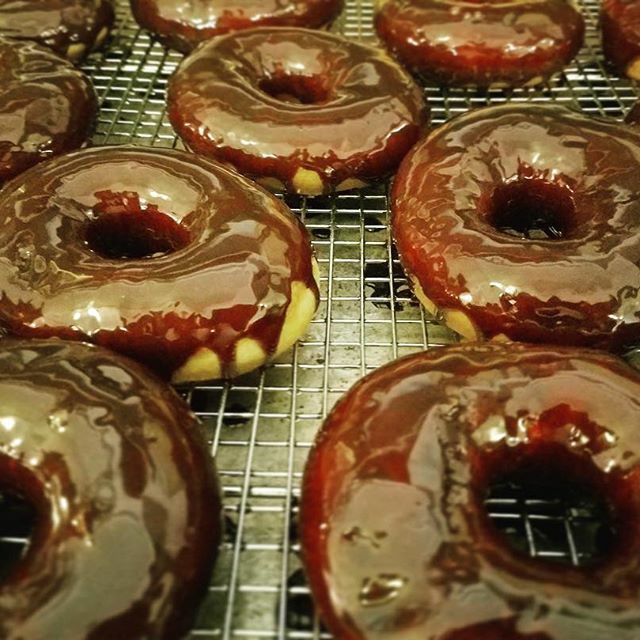 They are everything a doughnut should be. 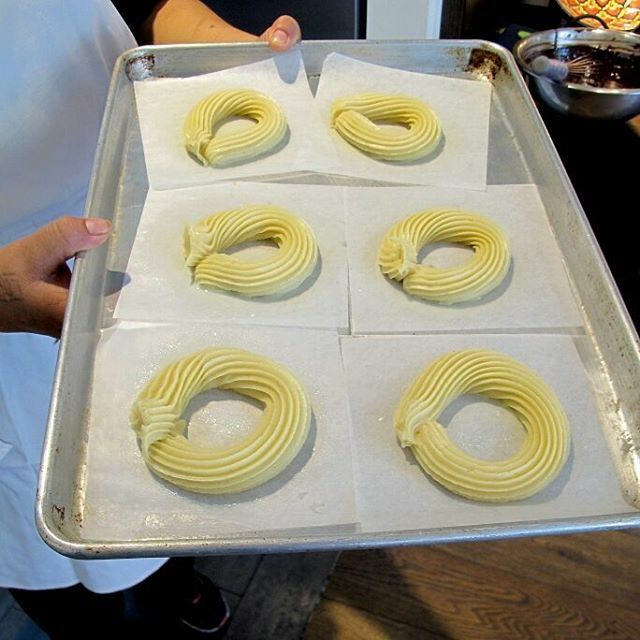 Made fresh in our kitchen they will remind you that doughnuts should be eaten as part of a regular diet. 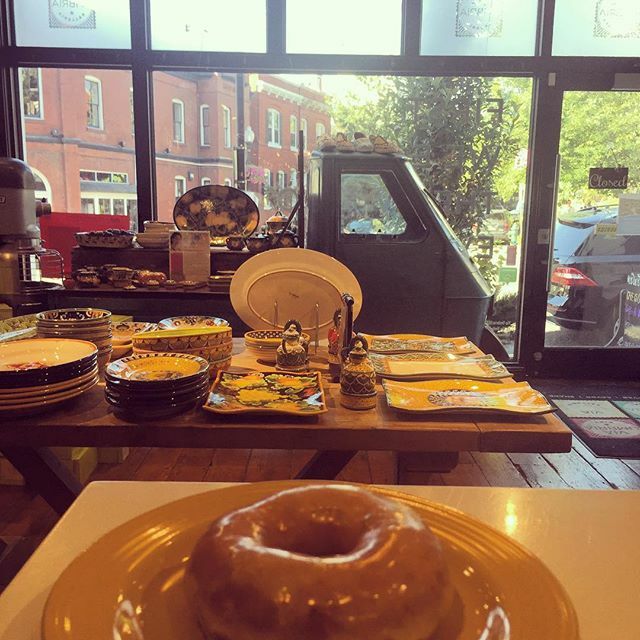 Join us at Via Umbria on Saturdays and Sundays after 9:00 am for hot fresh doughnuts. In a country that is renowned for its warmth, charm and grace, Umbrians, with their authenticity, approachableness and their connectedness to each other, their land, and their culture stand out. For me, there is no place in which this authenticity stands out more than around the dinner table. 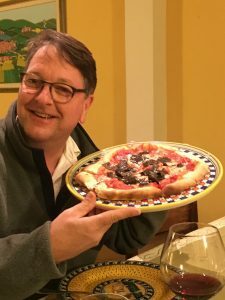 When I think back on the many (many) meals that I have enjoyed in Umbria, each one is colored with the rosy glow of being surrounded by strangers turned friends and friends turned family, all sharing stories, wine, and food and all living in the moment. The food is simple yet exquisite, the company is fascinating yet unassuming, and the conversation is energetic yet relaxed; every day brings a new experience and every night is a celebration. 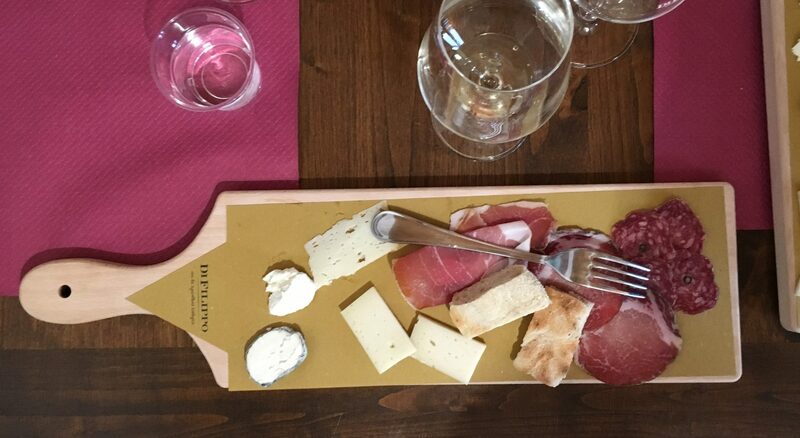 A visit to Umbria is truly an opportunity to experience authenticity in all aspects of what it means to be Italian. 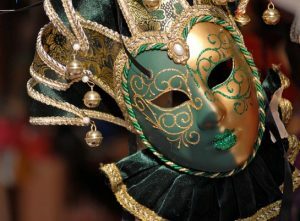 This is the feeling that drives much of what we do at Via Umbria. We have created a space for friends and neighbors to meet, to eat, and to relax. 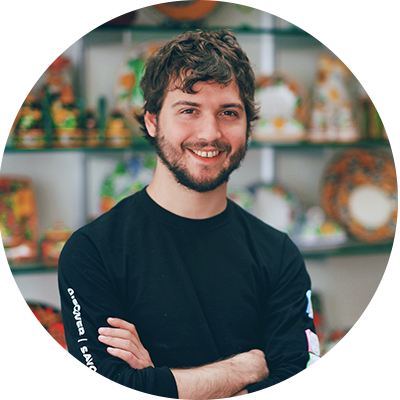 A place to showcase the work of the amazing artisans of Italy, from ceramicists to winemakers, and to introduce their products and their stories to a new community. Above all, however, we are determined to recreate the feeling of sitting around a dinner table in Umbria- sharing food, telling stories, and creating memories- and from this the Laboratorio was born. From the communal style seating to the open kitchen format, every aspect of the Laboratorio was designed with the Umbrian experience in mind. The space was created to be open, to be flexible, and to be interactive; in short it is our Laboratory, our space to explore and to create. For those of you who have yet to join us for dinner imagine it like this: take one part dinner party, add in one part of your favorite cooking show, one part wine tasting, and combine those together with a beautiful setting and an engaged group of friends and neighbors sharing a unique and unforgettable experience and you may start to get a sense of what I’m talking about. But as with all things, the best way to truly understand is to see it for yourself. 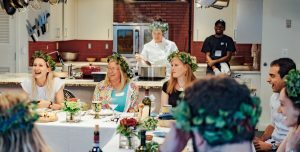 Join us for dinner Thursday – Saturday night, or for brunch on Sunday for an unforgettable feast in our demonstration kitchen. 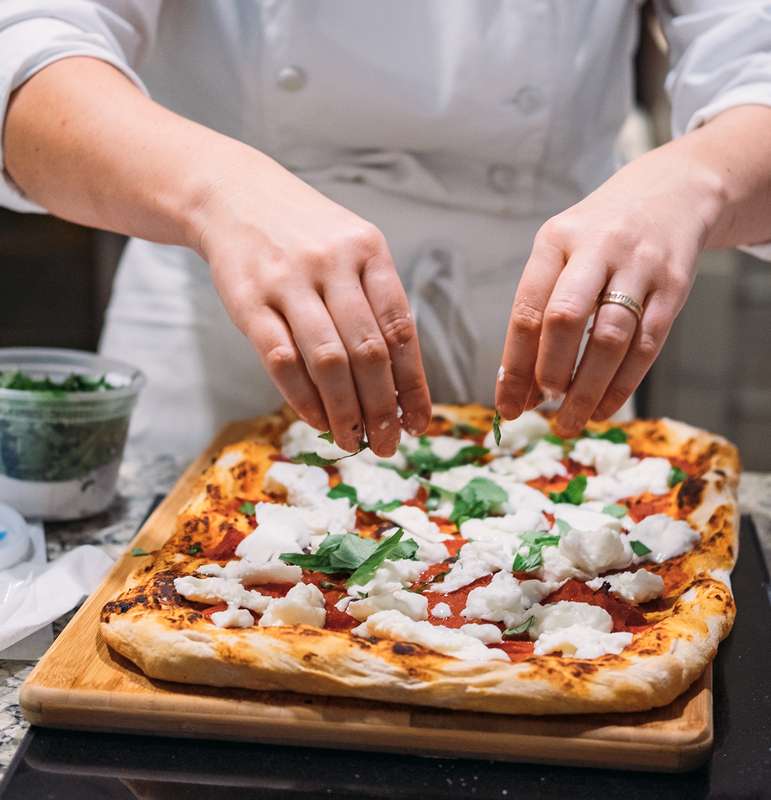 Enjoy a Thursday night Demo and Dinner and let Chef Johanna Hellrigl teach you her favorite recipes from all over Italy before retiring to the communal table to enjoy the fruits of your labor. Visit us on a Friday night for a CYOB Dinner and let us teach you about a selection of wines from our unique cellar during a guided tasting before choosing your favorite bottle (or bottles) to accompany your meal. For the wine lovers, I encourage you to join us on a Saturday night for a Wine and Dine dinner where each of four courses is paired with a unique wine chosen and discussed by our experienced wine staff. And for those of you who crave relaxation at the end of your week, we welcome you to our Sunday Bottomless Bellini Brunch. No matter the format, no matter the day, a meal spent around our table will be one to remember. I recently started watching the Netflix series Stranger Things and I really like it. 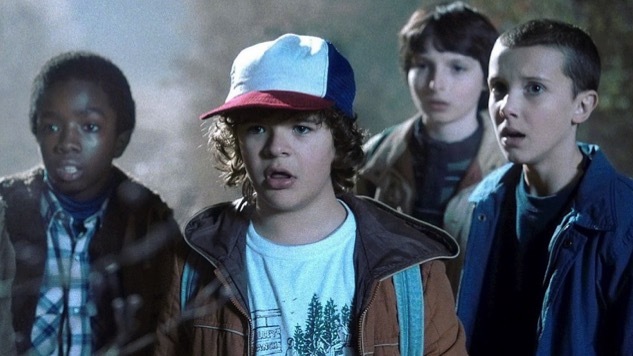 The show, which is set in rural Indiana in the 1980s follows a group of kids seeking to find their missing friend, and involves a secret government program that punches a hole through parallel universes in order to engage in some cold war spying, only to unexpectedly unleash an incredibly evil monster. Some great acting, especially from the kids, some creative writing and some compelling story lines. I would definitely say it is worth a watch. I mention this because Via Umbria has been engaged in its own project to bridge parallel universes. And far from unleashing monsters, we have only spread deliciousness and joy. Those two universes are, of course, Italy and America and we are engaged in an experiment to connect the two. We do that by creating an authentic Italian experience in Georgetown. 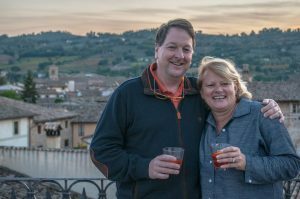 And we do that by hosting American guests on semi annual food and wine tours at our farm house in Umbria, immersing them in the authentic Umbria that we have come to know and love. On Saturday, we arrived in Umbria with nine guests in tow to kick off our fall Food and Wine tours, and less than 36 hours later, I dare say that they have already begun to understand and share our love of Umbria. Yesterday we introduced them to the wines of Umbria, the same Grechettos and Montefalco rossos and Sagrantinos we import and sell at Via Umbria. 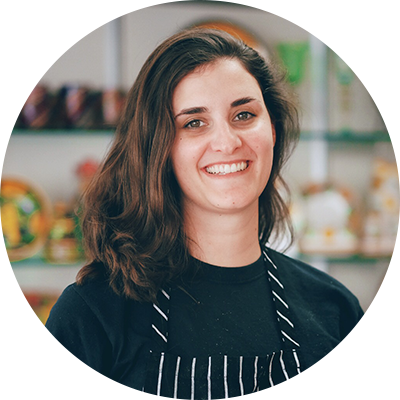 They met Elena DiFilippo at her organic and biodynamic cantina and drank wine with her, and will welcome Elena’s husband Roberto when he visits Via Umbria this spring. 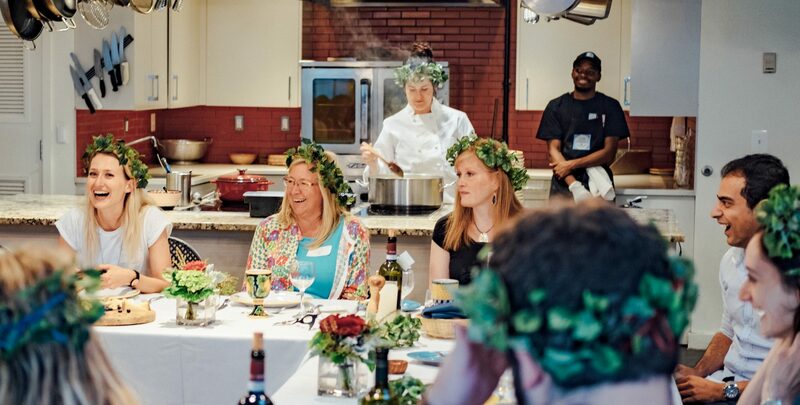 They dined on a homecooked dinner by Chiara Cicogna and heard her speak of her family’s cashmere business, and will join Chiara and us in Washington on November 16 when Chiara exhibits a selection of cashmere treasures at a special holiday trunk show at Via Umbria. 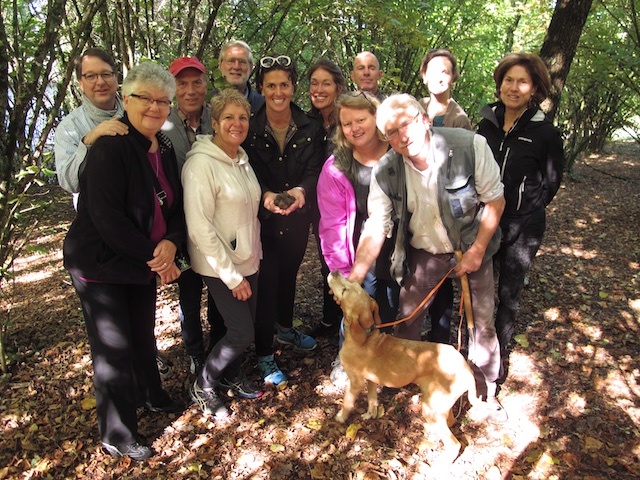 This morning they experienced truffle hunting under glorious blue skies near Citta di Castello with our dear friends Saverio and Gabriella Bianconi, who are readying to ship the day’s spoils back to Via Umbria to take center stage at a pair of special truffle dinners coming up next week. Nearly a year after reopening our doors as an Italian market, café, restaurant, enoteca and retail store, we are realizing our dream of truly connecting the worlds we inhabit in Washington and in Umbria. This week our food and wine tour group will dine at le Delizie del Borgo, a restaurant lovingly operated by our friends Simone Proietti-Pesci and Ombretta Ubaldi in Bevagna and next month Ombretta, a certified sommelier with an unmatched appreciation for Umbrian wines will return with us to Washington to host a series of special wine dinners at Via Umbria. 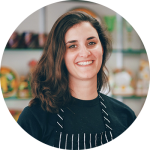 Later in the month Simone will join us in Georgetown to cook alongside our outstanding executive chef Johanna Heilrigl. We can’t wait for these two to renew their acquaintance and to dazzle us with what they think up and cook up next. A tasting at the Tabarrini winery on Thursday will no doubt be a highlight for our guests, but a command performance in Washington is in the cards, with a special visit by the winery’s owners Giampaolo Tabarrini and his wife Federica Pietrolati for some memorable dinners and maybe a glass of wine or two. 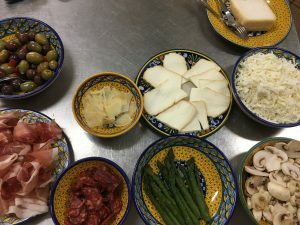 Connecting our guests and our customers to the incredibly rich experiences that we have found in Umbria is what we do, regardless of place. Whether it takes place sotto il sole or under the sun, in Cannara or in Washington, these are the experiences that make up a life and we are proud to offer them to you. If produce is the gauge by which we measure the seasons, summer must be just around the corner. At Via Umbria we are getting the first zucchini–you know the ones, small and tender opposed to the overgrown bat size zucchini ones that conveniently show up on my porch when no one knows what to do with them. I love zucchini all summer long and thrive on finding new and different ways to prepare it so that we can eat it everyday. But the best part of the zucchini is the blossom. 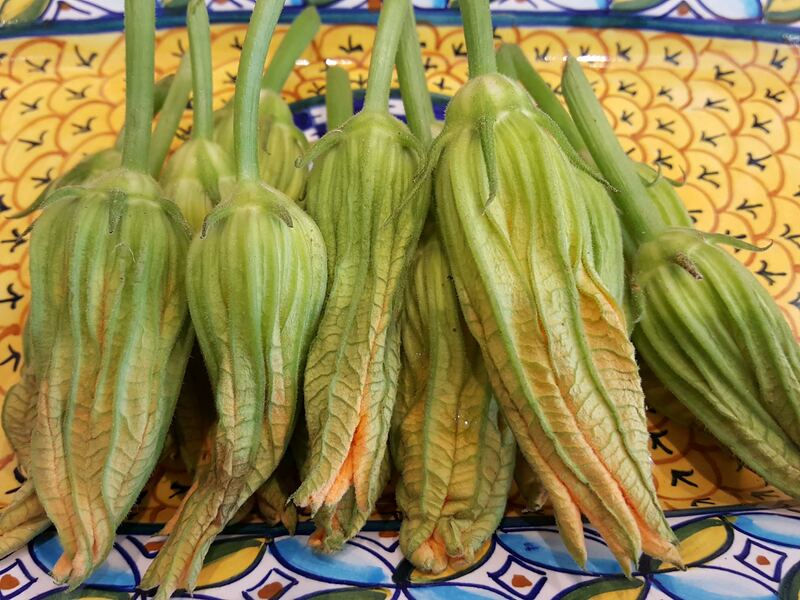 Zucchini blossoms are the first sign that the fruit will be ready in a couple of days. You can enjoy the sweet blossoms straight from the garden, add them to scrambled eggs or salads, stuff them or the simplest easiest way is to make a light batter and fry them. Light and crispy on the outside and sweet melt-in-your-mouth on the inside. At Via Umbria you can choose to buy your own and experiment at home or look for them in our cafe–definitely fried but also in salads. 1. Beat together flour, egg, and water with a whisk. The batter should be very thin. 2. Dip the clean zucchini blossoms into the batter and immediately submerge in hot oil. 3. Cook them quickly (1 minute or less), then remove from oil and place on a towel lined plate. 4. Sprinkle lightly with salt and enjoy! There’s nothing quite like a fresh spring berry to add a punch of sweetness to any dish. With the bounty of fresh produce coming from the garden this time of year, we have a special fondness for salads in spring. For those of you who, like us, don’t always have the strongest sweet tooth we recommend turning these sweet, springtime delights into a tangy, savory salad for dessert. Salad? For Dessert? Trust us–once you try this rich, flavorful dish you’ll never think of salads (or strawberries) the same way again! As simple to make as it is delicious, this Italian take on a fruit salad is the perfect treat for breakfast, dessert, or your next cookout. Next time you visit Via Umbria, pick up some fresh organic strawberries and a bottle of our finest balsamic glaze so you can whip up this salad at home. Slice fresh strawberries and mix in diced onions. 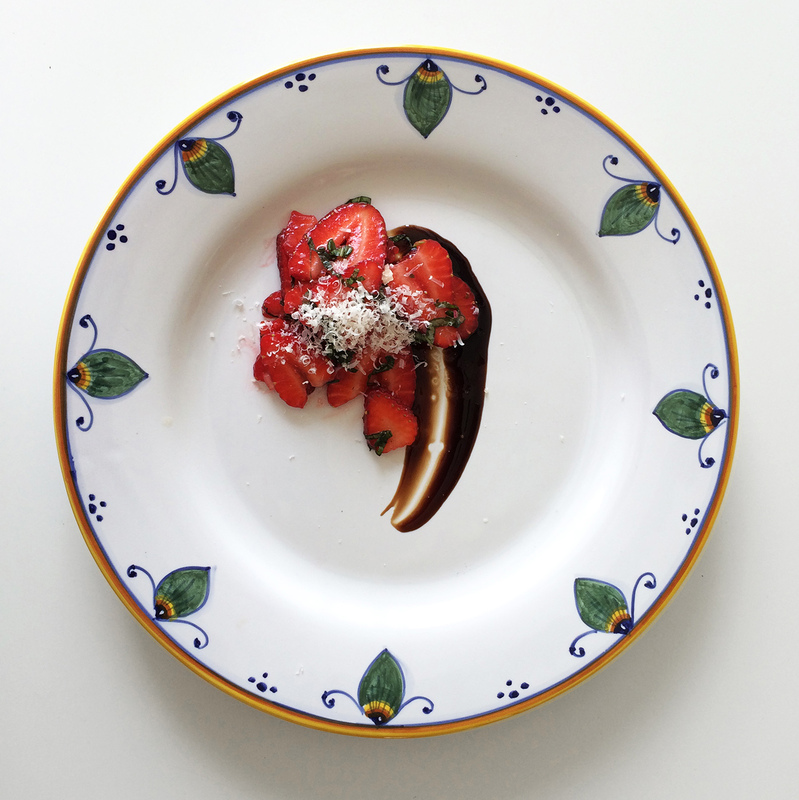 Drizzle with Balsamic Glaze and top with shaved parmigiana. You can plate it beautifully like we did, or just dig in and enjoy! If you’ve been by the Via Umbria meat counter lately you may have noticed a steak called the teres major. Despite its strange sounding name (it is the scientific name for the muscle, one that humans also have), the teres major is actually steak familiar to most of us. 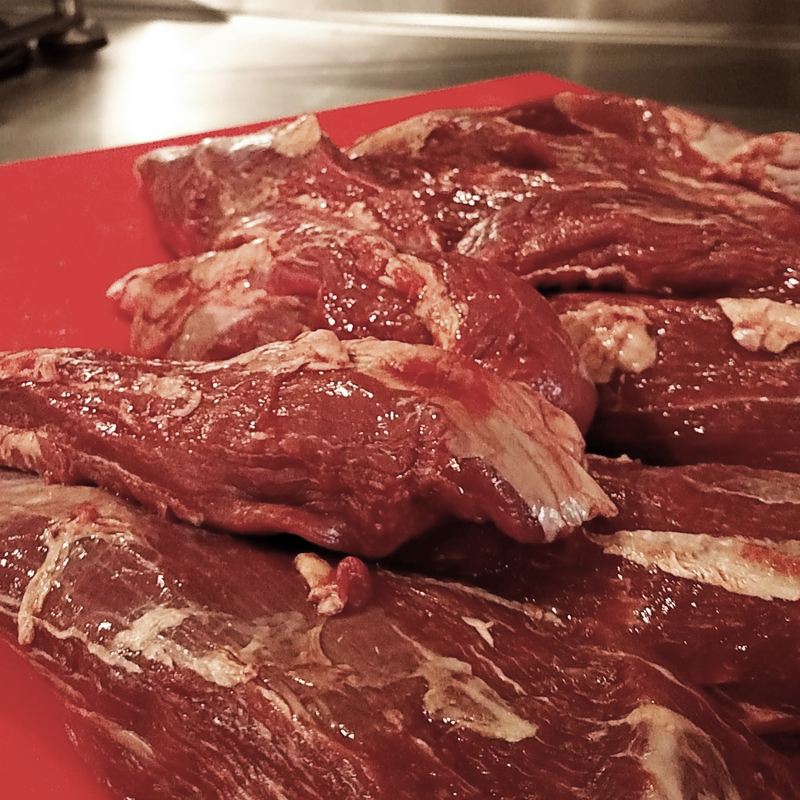 Cut off of the chuck, the shoulder of the cow that is traditionally used for ground or stew meat, the teres major is a muscle that is rarely, if ever, used by the cow during its lifetime. 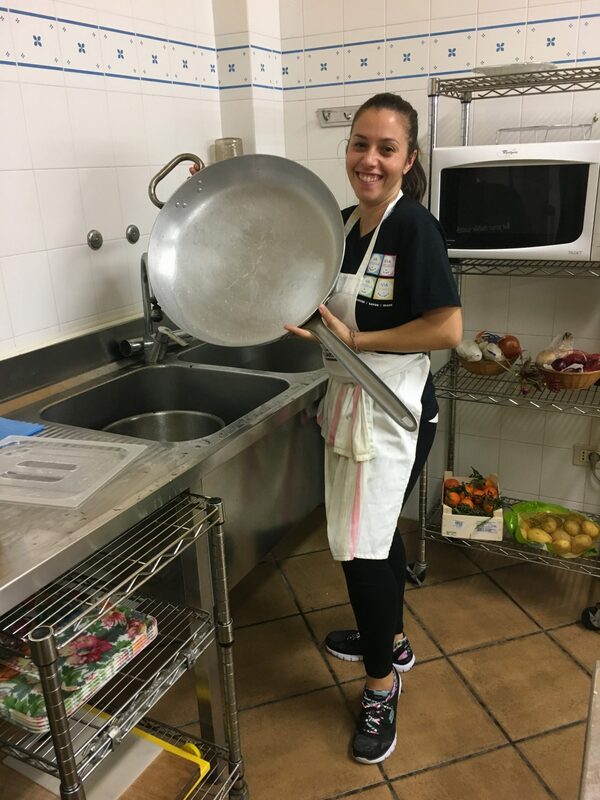 This gives it a unique set of qualities when it’s time for the cook to take over. First and foremost, it is soft. This means that even after you cook it, even when you cook it well done, it is tender. Secondly, there is virtually no intramuscular fat. This is the type of fat that gives the ribeye its pronounced rich flavor, and it is the type of fat that is impossible to avoid eating (not that you really should want to). There is one other muscle that has these two qualities: the beef tenderloin, or as it is known on most steakhouse menus: the filet mignon. 1. 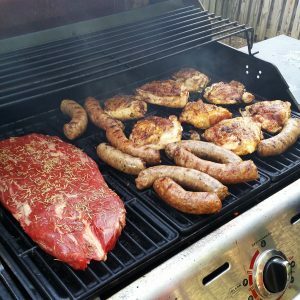 Fat cap – This will help protect your meat, keeping it moist while cooking, but it can also catch aflame when grilling. I always advise removing the fat cap after cooking, if you don’t want to eat it. That being said, I also think it looks great on a plate. 2. Visible grain – You’ve probably heard the expression “slice against the grain,” and that’s 100% true. That being said, there are several steaks with visible grain running perpendicular to the length of the steak. These are your hanger steaks, skirt steaks, bavette (flap meat) steaks, et cetera. In Italy these are the steaks called tagliata di mazo, sliced beef steak. In the New World, the skirt and the bavette are the most common cuts used in fajitas. 3. Intramuscular Fat – These small flecks of white within the meat are what give the ribeye its prowess as a steak. Unlike the fat cap, this is a fat that cannot be removed. But why would you? This is a fat that adds a richness of flavor that makes the steak versatile. It can be sliced thick and eaten as a steak, it can be ground, it can even be sliced think and served on a bread with some cheese whiz or provolone! 4. Pliability – This is the one that needs to be felt rather than seen. Both the tenderloin and the teres major are incredibly soft and flexible when raw. That is how you know they are incredibly tender. So this isn’t a complete list by any stretch. There are so many different cuts of beef that can be used as steak or otherwise. It is, however, the four most important factors for me when judging how I will prepare the meat that I have purchased. It also helps you when you have a recipe that calls for a specific cut that you can’t locate (even though, if you call us in advance, we’ll have it for you!). There is always a similar enough cut of meat that you can use. Just don’t be afraid to ask! Yes, you read that right. Via Umbria is thrilled to report that we’re starting our own Cheese of the Month Club! Here’s the deal: every month, members will be able to pick up half a pound of one of our beautiful cheeses, selected by me, your friendly neighborhood cheesemonger! The cheeses will vary based on season and what is tasting particularly delicious at the moment. We’ll kick off every new month with a tasting event–an evening at the store when you can pick up your new cheese, taste it, learn about how to pair it with beverages and condiments, and ask any questions you may have. It’s a great way to expand your cheesy horizons and try something new and exciting! 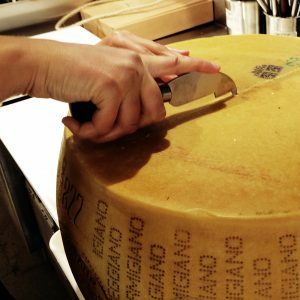 Since we’re an Italian store, we decided to kick off this exciting new venture with Parmigiano-Reggiano, the “King of Cheeses.” A classic for a reason, this delicious giant is renowned the world over for its nutty, sour, fruity character. Not to be confused with generic, dusty “Parmesan”, real Parmigiano-Reggiano is, by Italian law, only produced in a handful of provinces in Italy: Parma, Reggio Emilia, Modena, and Mantua. Made with partially skimmed raw cow’s milk, the Parmigiano-Reggiano curds are initially packed into 100lb wheels and loaded into stainless steel molds so that they can take on their wheel shape. (Fun fact: the whey that’s siphoned off from the curds during this step is traditionally fed to pigs used for Prosciutto di Parma.) After a few days, the molds are removed and the name “PARMIGIANO-REGGIANO” along with the the plant’s number and the date are printed onto the outside of the cheese. This is an easy way to spot a real wheel of Parmigiano-Reggiano–only the real thing will have its name emblazoned on the outside of the wheel. After spending a few weeks in a brine bath to absorb salt, the cheese is then allowed to age for a minimum of 12 months, and a maximum of 36. After being checked for quality and passing inspection, these cheeses make their way to cheese fans around the world. People have been enjoying Parmigiano-Reggiano since at least the 13th century, and with good reason–it is one of the most versatile cheeses on the planet. It can be grated over pastas, shaved over salads, stirred into soups or risottos, or just cut into chunks and eaten as is. While most people think of this as a rock hard cheese, when it’s first opened and unoxidized, the interior of the wheel, or “heart”, is very soft and full of moisture. It’s only after being exposed to air that the cheese dehydrates and becomes drier and less flavorful. It’s for this reason that we always recommend buying a large chunk of Parmigiano-Reggiano as opposed to pre-grated or sliced–the less surface area that’s exposed to air, the more moisture your cheese will retain and the less flavor you will lose. 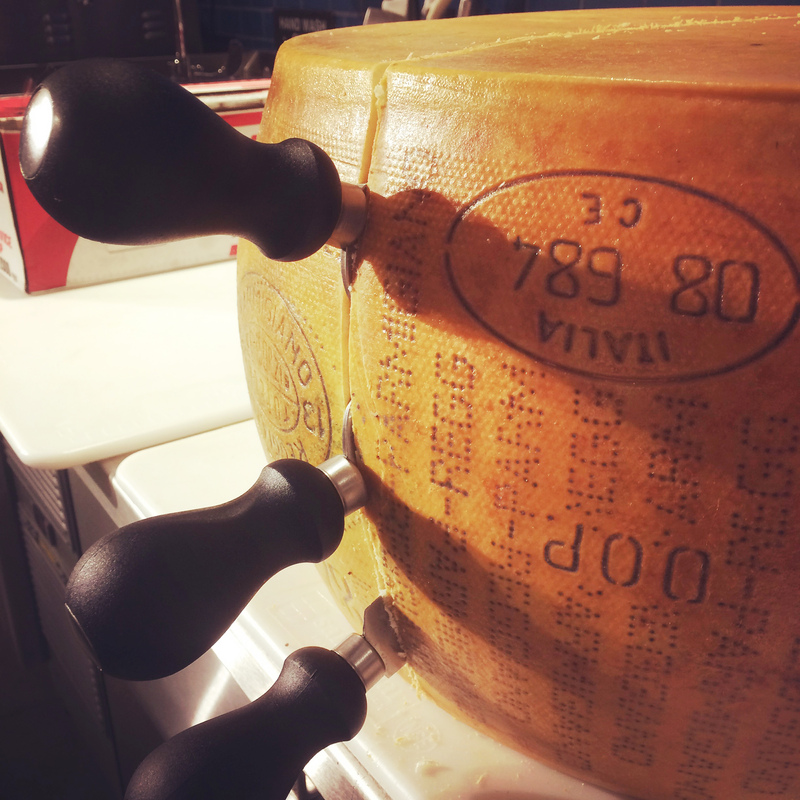 You’ll have a chance to taste the heart of the Parmigiano-Reggiano when we open our newest wheel at our kick-off Cheese of the Month Club event on Wednesday, June 1st. We’ll taste, talk, drink, and generally get to know all about our inaugural cheese. You can find more information about the Cheese of the Month Club here. Can’t wait to see everyone there! Today, I drive waiters and waitresses (and occasionally those same children) crazy as I insist we sit and wait for our drinks before ordering our meals. ‘No–I’m definitely not ready to order yet. I want to have a drink well in hand before my dinner starts to arrive.’ By design, cocktails are meant to be lingered over, to be enjoyed and so what better time is there than Cocktail Hour to sit back, relax, and reflect on the day. I know what you’re thinking–how does one so easily transition from a quiet dreamer to a cocktail savant? It wasn’t easy. As newlyweds in the ‘80’s, cocktails weren’t as popular with our generation, and Bill and I were just learning to enjoy wines by the bottle instead of the box; most of the cocktails we had enjoyed had been purple and served from a large garbage can stirred with a paddle. Imagine my shock and delight when he came home from work one day with a brown bag. “What’s that?” I innocently asked. “Whiskey and Vermouth–tonight we start learning how to drink Manhattans.” And so the journey began. 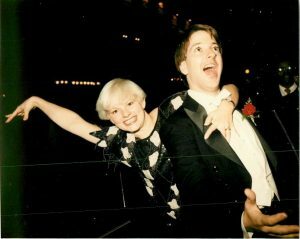 I hate to brag, but I think over the last 30 years we have perfected the art. 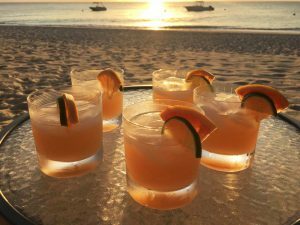 To those who are foolish enough to follow my personal Facebook page, I am notorious for my sunset cocktail photos on the beach. While it may be possible to enjoy a sunset without a drink in hand I’m not sure I ever want to experience it. When on vacation, it has become a daily game for Bill and me to find the perfect daily cocktail–something that is capable of capturing both the spirit of the day and the gorgeous backdrop of the setting sun. 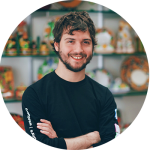 About 5 years ago travelling throughout Northern Italy–specifically Venice, Bossano di Grappa and Trieste–we started noticing everyone drinking a beautiful orange drink. Even as a self proclaimed Cocktail Aficionado, the olive in the bottom confused me–I couldn’t for the life of me figure out what orange liquor could be paired with an olive. I took one for the team, and so began our introduction to the Aperol Spritz: the 3-2-1 of drinks. 3 parts prosecco, 2 parts Aperol and 1 part sparking water, served over ice with a bitter green olive. Now seen throughout Italy–more typically with an orange slice than the olive–you will find Aperol Spritz served winter, summer, spring and fall. It’s the perfect drink for any season and every occasion–not too light and certainly not to intense. A very drinkable cocktail any time of day. And cocktails are back. Small craft distilleries are springing up around the city, around the country and around the world. And this time the focus is on creating the perfect sip with fresh squeezed juices and herbs, tonics without high fructose corn syrup. Creating sprits with different approaches and different flavors. Now more than ever is the time to experiment with cocktails. 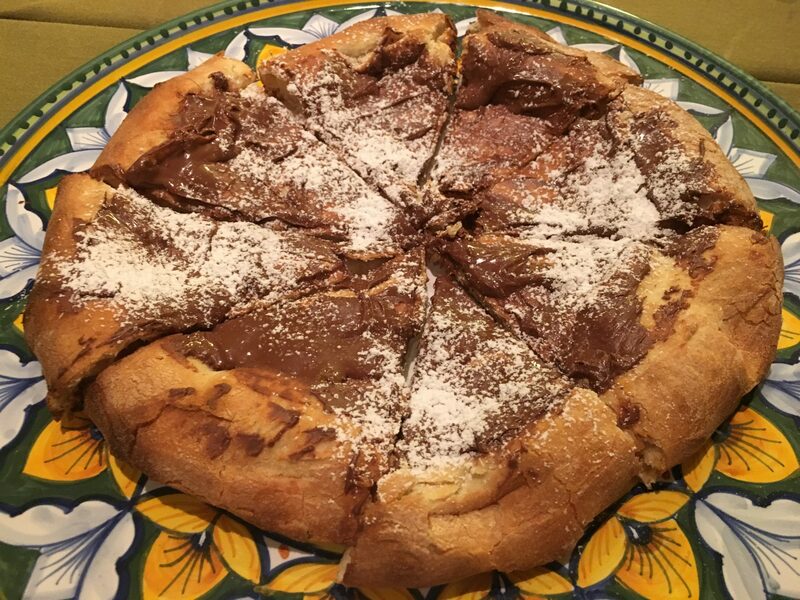 At Via Umbria our commitment is to: All things Italian. All things artisanal. All things local. Our cocktail program is a perfect reflection of the three. Come rediscover the art of cocktail hour with us. Join us daily for Spritz O’Clock (5-7pm in our Cafe) and spend Saturdays discovering your new favorite cocktail or glass of wine. Pair that with our new menu of Spritz O’Clock Snacks and street foods and it’s the perfect way to relax, unwind, and enjoy an hour or two. For us, Via Umbria is not just a store, it’s our story and we want you to be a part of it. Come on in and Discover Spritz O’clock with us. Savor a drink or two with us. Share the news with friends and family.